The Dali Project was launched in 2016 with an exhibition at Beijing Design Week. This exhibition acted as a catalyst to both present research that had been done in Guizhou and Dali village as well as to deepen the engagement with textile artisans in Guizhou. Situated in a multi-room hutong home in the Baitaisi neighborhood of Beijing, as part of the Baitaisi: Re-Made initiative, The Dye Room was conceived of as a kind of platform to test a number of activities and ideas relative to the research ATLAS had conducted in Guizhou. Bringing this content to Beijing Design Week was a way to build a bridge between the Dong community and a new urban arts audience in Beijing. The exhibit was comprised of a pop-up shop, design exhibition, installation, workshop, and symposium — all of which unfolded over the course of one week. Ultimately the exhibit was a way to jump start a longer engagement in Guizhou and to bring various stakeholders to the table to see the possibilities for activating these traditional practices in new ways. The Temple of the White Dagoba—Baitaisi—anchors the historic Beijing neighborhood where The Dye Room was located. In the months leading up to the exhibition ATLAS began the engagement with the textile artisans in Dali village by commissioning a set of 30 pillows, with five different designs. Because the production of textiles in Dali village is not commercialized —each women makes things for her own and her family’s personal use—it required a significant shift in the mental model around textile production to start this new design process. While seemingly small in terms of complexity of design, the pillows were a means of creating a simple template that could be the basis for endless variation and design innovation. To complete the first five designs, the young designer Weidan from ATLAS spent a little under a month in the village helping to prototype, introduce concepts of quality control, and refine the designs. To begin the collaboration two women from Dali were approached, Shenshu and Bimeng, who both had small businesses as seamstresses in the village. This meant they had prior experience working with others in order to create something new and as a result they have subsequently become part of the core foundation for engaging and organizing other women in the village to make and sell textiles through the Dali project. During BJDW these pillows were offered for sale in order to test the responsiveness of the market and to begin to plan future offerings. Outside of Dail, in the township of 榕江 Ronjiang, there is an existing textile cooperative called Shepard’s Family that has been in operation for over ten years. This cooperative begun by a local Dong woman, 赖蕾 Lai Lei, and organizes over 200 Dong textile artisans who produce a wide variety of products, hand woven textiles, and naturally dyed cloth. One particular piece Lai Lei produced was a year-long research project that explores the potentials for indigo dye. The year of research follows the terms of the Chinese lunisolar calendar which is attuned to agricultural patterns and breaks time into 24 seasonal division points that mark time and environmental shifts such as, The Waking of Insects, Pure Brightness, The End of Heat, or the time of White Dew. In Guizhou, Indigo is traditionally prized for the deep purple-blues that can be achieved at optimal dying-times of the year, most often in the late Fall. Nonetheless, this project pushes back on that ideal—using the lunisolar calendar as a framework to break open the traditional dying process. Cloth that has been dyed in indigo at 24 points of the year introduces a wide spectrum of tones that emerge in different seasonal and climatic conditions. Going from almost white-icy blues in the winter with crackling patterns caused by freezing weather , to the grey-green inflected blues of the humid summer, eventually the cloth arrives at the “correct” dark indigo hues in the depths of fall. This experimentation with the Indigo dying process creates an index of atmosphere and a visual measure of the passage of time. The year-long project resulted in 24 rolls of handwoven, hand-dyed cloth. In order to give viewers an experience of the breath of this work ATLAS constructed an “indigo” room made up of cloth. Furthermore, because indigo has a distinctive natural scent—the room was a way to envelope the viewers in a sensory realm of blue— both seen, touched, and smelled. 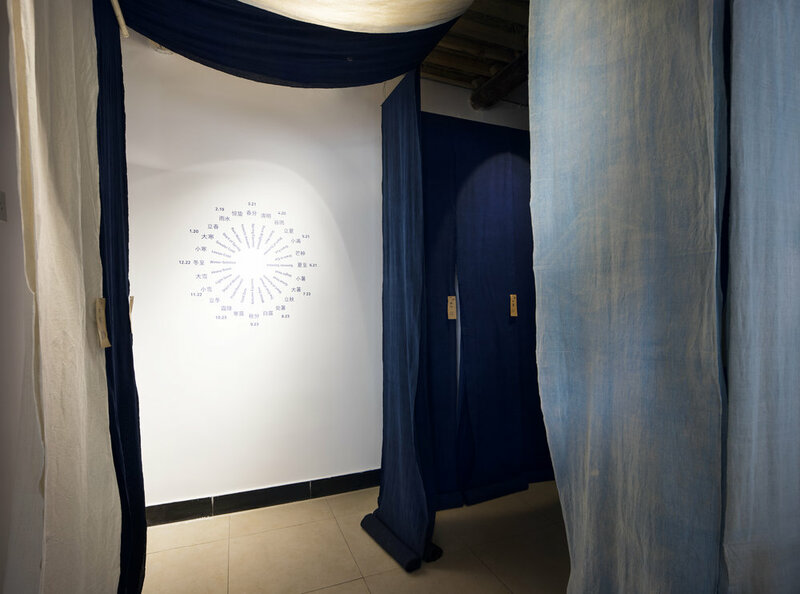 A secondary collaboration with 赖蕾 Lai Lei resulted in the creation of an authentic indigo dye bath and workshop that was situated inside one room of the exhibit. Bringing raw dye materials from Guizhou to Beijing was not a simple task and a local master dye artist, —-, was crucial to making it happen. Because the bath is “alive” as a kind of fermentation process the bath needed two weeks of constant care in order to be ready for dying cloth. Strict rules from Dong culture also govern who can start the bath, touch it, and what days of the month are auspicious for trying to bring the fermentation to life — and these protocols needed to be followed in the making of the dye. The end result was that a number of fold and clamp dying workshops were held in the exhibition space allowing a new audience to experience the techniques of natural indigo dying firsthand. The workshop and dye bath made with pigment “mother dye” brought from Guizhou. Shenshu and Bimeng help tend to the dye bath—that needs continued attention. Guizhou’s textiles function like a codex for it's ecologically diverse landscape by transforming botanical, animal, mineral, and atmospheric elements into cloth. With TERRAIN, ATLAS goes beyond Dali village to understand more about the textile traditions being practiced regionally. The investigation explores the potentials for design through the lens of four types of fabric, rain-bleached cloth, glossy cloth, burnished indigo cloth, and ATLAS’ studio-crafted lichen cloth. The studio utilizes these textiles in a variety of ways—creating artifacts that carry the layered materiality of landscape. The rain-bleached cloth achieves its brightness and softness over time from the ambient dew that gathers in the early morning fields where it hangs to transform. The indigo textiles are made from fermented natural indigo and local rice wine and are finished either by polishing by hand or with a thin coating of egg-whites to achieve a deep glossy sheen. The lichen cloth is hand-painted on unbleached, hand-woven cloth, and is inspired by the merger of stone and vegetation in forest lichens. Dali pillow designs and TERRAIN products together. The Nomad Chair — a contemporary take on the classic folding camp chair featuring indigo glossy cloth. Knowledge exchange is central to the mission of the Dali Project. In light of this goal, two textile artisans from Dali, Shenshu and Bimeng, agreed to come to Beijing to help present the work to the Beijing Design Week audience. This gave them a chance to see their work situated in a new context and to better understand the interest outsiders continue to have for traditional textile work. It was also a way to create a lateral exchange between Dali and Beijing wherein travel and experience flows in both directions. Exhibiting work in The Dye Room essentially marked the launch of the Dali Project and was a way to catalyze research in Guizhou as well as a way to test how the collaboration with Dali village might scale and grow. In other words, this was a moment of both reflection and a way to frame the questions that would move the project forward. To support this process, a half-day symposium was organized to gather like-minded researchers, organizers, entrepreneurs, and others to try to understand issues of intangible cultural preservation, community regeneration, and social enterprise. The individuals sharing had hands-on knowledge of the issues faced when trying to navigate future paths for craft production, home enterprise, and communities rooted in remote, rural locales whose economies have been primarily subsistence-based. It was also a conversation about what it means to link up urban and rural economies using new tools and strategies today. These issues present particular challenges and the symposium addressed not only the difficulties and paradoxes presented by this work, but the unique potentials for design that come from looking to cultural communities outside of the mainstream. In the context of a design week, this platform created a critical space of inclusion for these points of view inside the broader contemporary design debate—one that often focuses primarily on deeply institutionalized and centralized forms of disciplinary knowledge and authority. This symposium was an opportunity for an audience of designers and others to hear about alternative ways of engaging partners, doing research, and creating projects with direct impacts. The formulation “slow design” has often been used to indicate both pre-industrial modes of production as well as reduced forms of consumer consumption. By looking to traditional modes of production designers gain access to new insights about the use of natural materials, concepts of waste, alternative models for organizing labor, and the aesthetic potentials inherent in hand-crafted techniques. Designing in a way that bridges between these forms of production and the demands of the contemporary market can prove challenging and questions of framing, value, and viability are key factors. In China there has been a rapidly growing interest in preserving and developing the craft sector that has been prompted by an evolving understanding of the future economic value of locations that possess strong cultural heritage and add to the diversity of cultural expression in the world. Against this backdrop it was an opportune moment to discuss both the potentials and challenges of working in the current context. “Thinking by Hand” was a means of bringing together designers with a number of professionals from other disciplines to help define new models and frameworks for collaborative work.